If you missed out on the offer to design your own cover for the August issue of Wallpaper* magazine, here’s another one for their September 15th anniversary issue. If you are already a subscriber, simply enter your subscriber number to get started. If you are not yet a subscriber (why would that be the case? ), simply buy the September issue online and follow the instructions to create your customized cover. The process is quite easy. 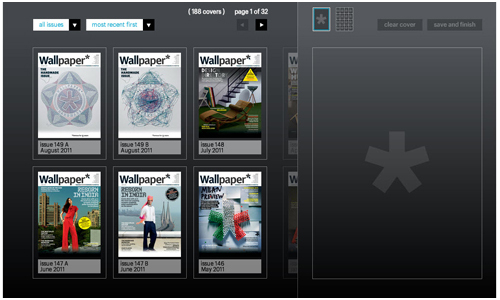 You can decide whether to feature one of your favorite Wallpaper* covers or feature a collage of your favorites. Simply drag and drop the images into the box on the right (pictured above) and click “save and finish”. Cost is £6/$10 for worldwide delivery. Read the complete details on how to get your cover on the Wallpaper* website. Have fun!